The bougainvillea is a tropical climbing vine that has a cascading network of stems producing vibrant flower bracts. The bougainvillea’s flowers are actually tiny and white, but the bracts are large, showy and can be shades of red, orange or purple. 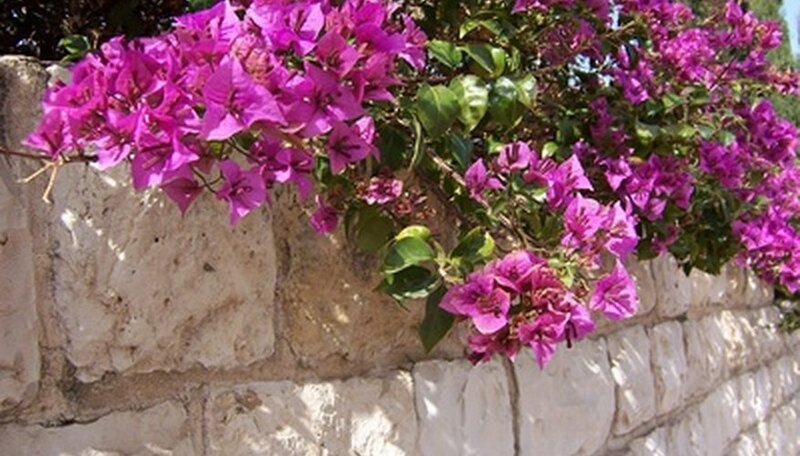 Bougainvillea can be grown as climbing vines or creeping ground covers. The bougainvillea enjoys average daytime temperatures of 70 to 85 degrees Fahrenheit and nighttime temperatures of 60 to 70 degrees. Bougainvilleas cannot tolerate winter temperatures that are below 35 degrees, so they must be container-grown and brought indoors in colder climates. Choose a companion plant for your bougainvillea that will contrast the shape and color of its vibrant flower bracts. 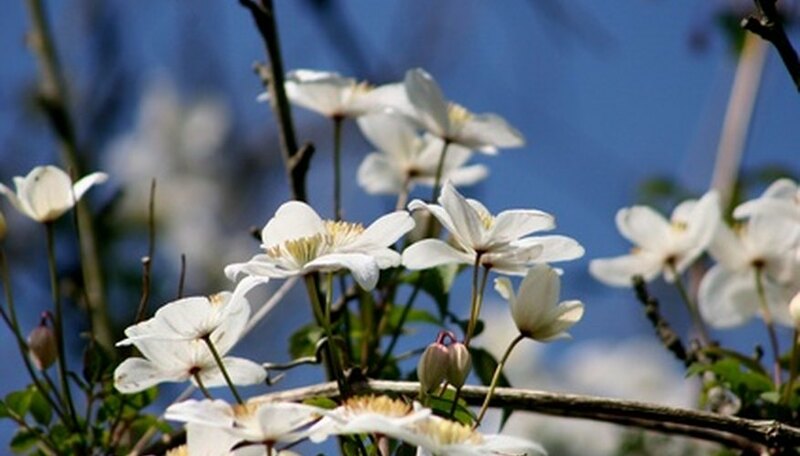 You can use an upright or sheared geometric evergreen, such as a skyrocket juniper or a privet, or you can pair the bougainvillea with another vine with white contrasting flowers, such as an evergreen clematis. Select a planting site for your bougainvillea and the companion plant that’s in full to partial sunlight, where the plants can receive a minimum of five hours of full sun each day. Choose a location that has well-draining, rich soil. Erect a climbing support for your bougainvillea, such as an arbor or trellis, if you want it to climb and grow upward. You can also allow the bougainvillea to creep along the ground as a type of ground cover. Dig planting holes for your bougainvillea and its companion plant, making the planting holes the same depth and one and a half times the width of the nursery containers. Space the planting holes as close together as 10 inches if you’re growing the bougainvillea up a climbing support. Space the plants as much as 2 feet apart if you’re allowing the bougainvillea to creep on the ground instead. Mix some rich organic compost or well-rotted aged manure into the displaced soil. Make your mixture about two-thirds native soil to one-third compost or manure. Plant the bougainvillea and the companion plant at the same depth as they were in the nursery containers. Spread a 3-inch layer of bark mulch on the ground over the root area of the plants to control weeds and retain soil moisture. Water your bougainvillea and companion plant evenly and moderately two or three times each week throughout the spring, summer and early autumn. Water your plants when rainfall isn’t adequate to keep the soil from drying out. Feed your bougainvillea once every two weeks throughout the year with a water-soluble 20-20-20 or 21-5-20 NPK (Nitrogen-Phosphorous-Potassium) fertilizer. Feed your bougainvillea at half the normal dosage rate. Be careful when you're removing the bougainvillea from the nursery container to transplant it because its roots are extremely delicate and sensitive to any damage. Don't over water your bougainvillea because it's susceptible to "wet feet," which causes root rot in poorly-drained soils. You should water your bougainvillea and the companion plant on a regular schedule during the first year to help their roots become established.